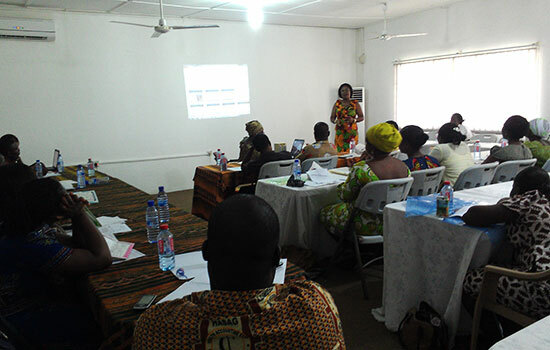 In January and February 2014, Inclusion Ghana received an in-house extensive training on monitoring and evaluation as well as advocacy funded by STAR-Ghana. The training considered general measures to improve practices to ensure greater effectiveness in future Inclusion Ghana projects. It also specifically considered our access to health project, which has been highly successful. At Inclusion Ghana we are always striving to improve out practices to ensure that our mandate of advocating for the rights and needs of persons with ID and their families can be achieved. From 11 to 18 December 2013, Inclusion Ghana, in collaboration with Talent Search International and Echoing Hills, trained 60 health professionals in the Kwaebibirem and La-Nkwantanang districts on access to health care rights for persons with intellectual disabilities (ID). The training was supported by STAR-Ghana with funding from DFID, DANIDA, EU and USAID and is in response to findings made by Inclusion Ghana in its 2013 report on access to health care, which revealed that persons with ID face discrimination and other deeply entrenched barriers when accessing health care. Nana Akua Owusu, Speech and Language Therapist and one of the trainers explained that persons with ID have often been invisible to mainstream health services and health professionals and many persons with ID do have additional health problems compared to the general population. By training health professionals on intellectual disabilities and how to improve communication, the stigma, discrimination and poor health care persons with ID experienced will start to disappear. 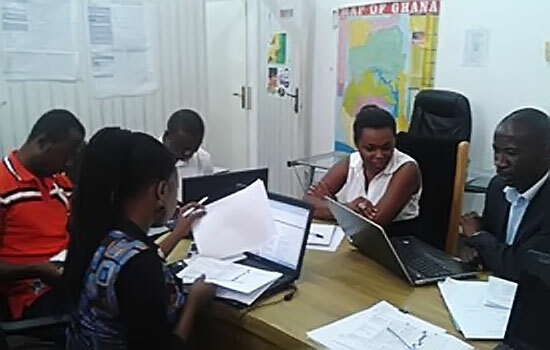 In particular, Inclusion Ghana is using 'change agents' to undertake activities in their facilities to ensure their colleagues also benefit from the knowledge obtained at the training. While Inclusion Ghana will train health professionals in a further 4 districts, Mr. Auberon Jeleel Odoom, the National Co-ordinator reports that this intervention should be carried out and repeated throughout Ghana to ensure the message reaches all health professionals. Highlighting the Ghanaian commitment to the Convention on the Rights of Persons with Disabilities, Mr. Odoom notes that it is the government's role to carry out this training and that "it is time for Government of Ghana to fulfill its responsibilities to persons with ID in Ghana and ensure they enjoy their right to health care and support, just like all other Ghanaians." 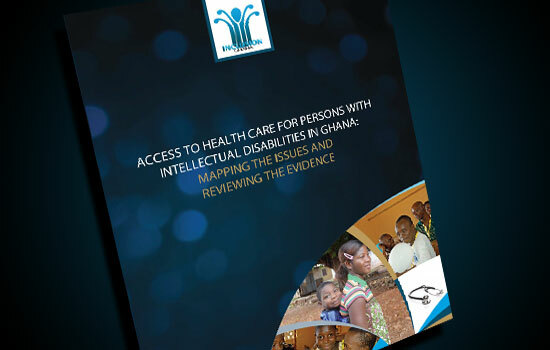 Inclusion Ghana launched a research report investigating the access to health care for persons with intellectual disabilities (ID). The research was supported by STAR-Ghana. The report reveals that persons with ID face discrimination and other deeply entrenched barriers when accessing health care. Without urgent government intervention, persons with ID face delayed diagnoses, secondary co-morbidities, persistent abuse, depleted social capital, and isolation. Inclusion Ghana use the occasion to draw attention to the dire health situation experienced by persons with ID in Ghana. Mr Auberon Jeleel Odoom, National Co-ordinator for Inclusion Ghana who presented the report findings explained that, "In Ghana, persons with ID are the forgotten and voiceless people. The World Health Organisation estimates that between 2 and 3% of the world's population has an ID, meaning that there are approximately 750,000 people in Ghana with an ID and yet their plight remains relatively unknown, even by health professionals". Persons with ID have often been invisible to mainstream health services and health professionals. They die younger and have poorer health than the general population. These differences are to some extent avoidable. The study confirms that persons with ID are excluded from general health care by numerous obstacles, including interplay between cultural and social environments, physical inaccessibility, and communication barriers. The report also exposes the lack of training amongst health professionals and the severe shortage of specialist services, meaning that many persons with ID do not even receive basic health care, let alone health care specific to their disability. Mr Odoom notes that the report indicates that the stigma attached to persons with ID, being that their condition is caused by "juju" or that they are "spirit children", results in discrimination by nurses and fellow patients at health facilities. This belief even stops some parents from taking their children with ID to hospital, as they are told to visit 'prayer camps' instead. Further, the cost involved in health care means that even those that wish to access mainstream health services do not believe they can, as the research estimates less than 13% of the population in the research districts know that persons with ID are eligible for free National Health Insurance Scheme (NHIS) registration. 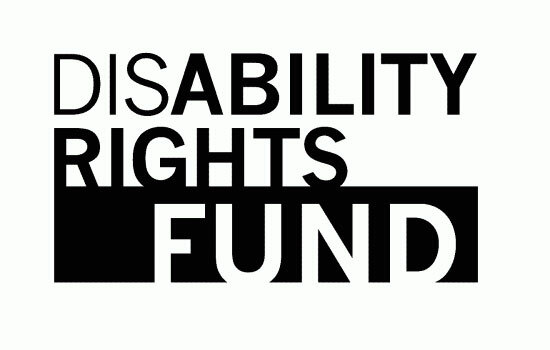 Inclusion Ghana is calling on all the responsible Ministries and government bodies to urgently help address the health needs of persons with ID, as the current situation means we are failing out international obligations under the Convention on the Rights of Persons with Disabilities. We urge all citizens of Ghana to join Inclusion Ghana to lobby government to provide an inclusive health care for persons with ID. The research report is available for download in the Reports section under Resources. - Activity 2: Train the 5 Coalition member organisations on the Inclusive Education policy and how to use the evaluation scorecard to review it. - Activity 1: Host a workshop where the 5 Coalition organisations can share experiences and where IG can provide direct feedback to ensure a quality final report is produced. 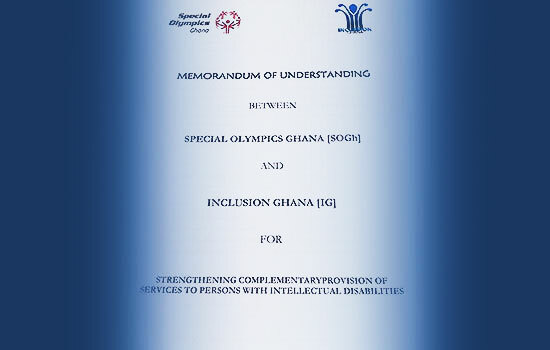 Inclusion Ghana and Special Olympics Ghana have signed a Memorandum of Understanding with the objective of strengthening complementary provision of services to persons with Intellectual Disabilities. The need for the partnership emanates from the mission of both organizations thus both organizations are providing services to persons with intellectual disabilities and these services are based on athletes, family members, parents and foster parents of persons with ID. The agreement is effective on 1st November, 2013 and will cover a period of three (3) years after which it would be reviewed and can be renewed depending on the performance and progress made in the joint venture. It is time for our athletes to start training!